It’s also safe to say that you’re trying to find the best air purifier for cigarette smoke and/or cigar odor. One that not only gets rid of the smoke itself, but also the smell as well. What you’ll find below is free information that shows you how to get rid of smoke inside a large room or home in the most effective way. You’ll also discover what the best type of air purifier is for smokers that keeps your house tobacco smoke and odor free. What is the Best Type of Air Purifier for Cigarette Smoke and Cigar Odor? One of the biggest problems cigarette and cigar smokers have faced over the years is the fact that in order to keep a home smoke free, he or she would have to smoke outside. Unfortunately, this option is not always possible or convenient. For example, a cigarette smoker or cigar lover may live in an apartment setting where smoking outside is not permitted. Therefore, if he or she wants to smoke, it must be done indoors. If the person lives with a non-smoker then this presents a problem for the other person too. Another classic example is a smoker who lives in a house and doesn’t want the inconvenience of having to go outside just to smoke cigarettes. This obviously leads to a home that smells like smoke, yet many smokers wish this didn’t have to be the case. Fortunately, in-home air purification technology has made major advancements in the last few years that has solved these problems. Now, both a smoker and non-smoker can live in the same dwelling without it being a problem for themselves or others around them through the use of a specially designed air purifier for cigarette smoke. Before we share with you what the best air purifier for smoke is, it’s important for you to first understand a few things about this technology. Knowing this little bit of information will help you to make the best choice for your situation. Because, you’ll discover that not all air purifiers are designed to get rid of cigarette and cigar smoke, and if you buy the wrong type of device, you’ll be wasting your money and not see any positive effects from it. You need a certain type of air purifier for smokers. The truth is that most air purifiers you find are not designed to get rid of smoke or other gaseous pollutants. They also cannot eliminate smoke odors. Instead, 99% of air purifiers are designed to get rid of particles that make up allergens, dust and pet dander. Because that’s the types of things most homeowners want an air purifier to do. Eliminating tobacco smoke is a special purpose. A True HEPA filtering system, which removes 99.97% of particles .3 microns and larger. This includes visible smoke. An Activated Carbon Filter, which absorbs the smoke odor. An Activated Carbon Filter is the real secret behind eliminating tobacco smoke odor inside your house. When shopping for an air purifier, you’ll come across many products that include a True HEPA filter. However, most of these devices are not very effective at getting rid of smoke because they don’t also have an Activated Carbon filter to get rid of the particles that make up its odor. Only an air purifier that can absorb the gaseous pollutants from smoke will work for your situation. Buying any other type of product will be a waste of money. Now that you know what to look for in the best air purifier for smoke and its odor, you now have enough information to make a good buying decision for your home. Below, you’ll find the two best products you can buy for smoke removal. Each smoking air purifier contains a True HEPA filter and Activated Carbon to ensure a smoke free home. This product tops the list because it was rated as the #1 air purifier for smokers by Cigar Aficionado Magazine. Because it uses a combination of six-stages of air purification and deodorization that makes it a leader in the industry. By far, this product creates the freshest air for smokers at a fair price. 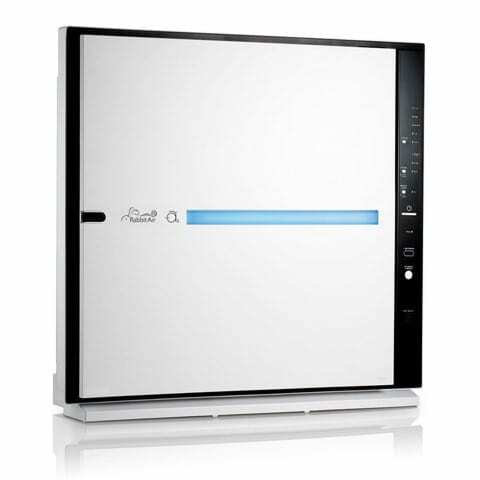 What also makes it the best smoke air purifier is the fact that it can be mounted on a wall or stand alone as a floor unit. The design is also unsurpassed in its field. No other air purifier looks as stylish as this product and you can customize the front panel display with various designs and colors. Finally, it’s perfect for any home because it can purify a space up to 700 sq. ft., which is ideal for most home applications. 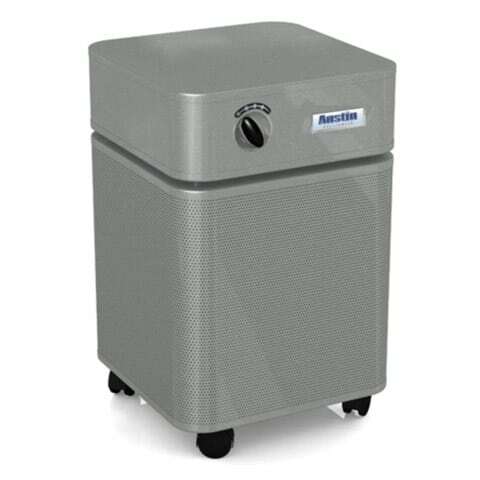 The second best air purifier for cigarette smoke and cigar odors is the Austin Air HealthMate HM 400. What you’ll love most about this device is that contains nearly 15 pounds of Activated Carbon, which is unmatched in the marketplace. It also draws air into the unit through all sides, making it a 360-degree air filtering unit. This makes it possible to place the device anywhere in the room and enjoy maximum air filtration no matter where it’s located. What’s even better is that this air purifier can purify an area up to 1,500 sq. ft. That’s more than enough power to create clean, fresh air in practically any size single family home. Finally, this smoke air purifier comes with a 5-year filter life, which means you won’t have to spend a ton of money each year to keep it running efficiently. The acronym HEPA stands for “High Efficiency Particulate Air” and you’ll find it attached to the word “filter” when searching for an air purifier. The word “true” is crucial here. To be classified as a True HEPA filter the filter has to be fully tested and certified in accordance with current HEPA filter standards. The minimum requirements for the filter is that it has to capture 99.97% (9,997 out of 10,000) of the .3 micron particles that pass through it. If the filter doesn’t meet this standard, then it wouldn’t be able to capture the finest particles that make up tobacco smoke. At their core, True HEPA filters are ultra-fine, glass-fiber substrates that capture microscopic particles which otherwise easily pass through other types of filters. It does this through a combination of diffusion, interception, and impaction. Impaction traps the largest smoke particles. This occurs during airflow when the particles come into direct contact with the fibers that make up the filter and end up embedded inside it. Medium sized smoke and odor particles are collected through interception, which is when the fibers grab ahold of them while they’re passing through. Diffusion is the process that traps the smallest particles of cigarette and cigar smoke. Diffusion is when the microscopic particles move and interact with the surrounding molecules already collected in the filter. As these pass through, their path is interrupted, which causes them to bounce around in an uncontrollable pattern. This finally results in the smoke particles getting trapped by impaction or interception. As you can see, an invisible chain of reactions is going on inside a True HEPA filter for it to get rid of tobacco and cigar smoke inside a home. Ironically, the more time the air purifier’s smoke filter has to run, the more molecules the filter collects. This actually makes the filter more efficient at trapping the finest particles of smoke because of the process of diffusion. Both of the air purifiers for smokers listed above have the highest grade of True HEPA filtration. No matter which one you choose, you’ll enjoy a home that’s free and clear of any signs of visible smoke because these particles can’t escape it. Activated Carbon Filters are a unique set of filters that are made up of a special type of carbon that has been processed to have ultra-fine pores. These small pores increase the surface area of the medium and allow gaseous cigarette smoke to be collected through a process called adsorption. This is not to be confused with the term absorption, which refers to the collection of liquids. Adsorption is the action of adhesion of molecules from a gas state to a solid surface. In a smoke designed air purifier, the odor molecules become trapped inside the pore structure of the activated carbon substrate. Once trapped, the scent of smoke dissipates because it’s not released back into the air. Often, the word carbon is used interchangeably with the term charcoal, however, carbonous materials used in air purifier filters can also include wood, peat, nutshells, coconuts, and lignite, which also contain high amounts of carbon content. The scientific process of converting carbon-based materials into activated carbon happens through a physical modification and thermal decay inside a furnace. After this process is concluded, the material ends up being transformed into a system of submicroscopic pores with a large surface area that’s perfect for adsorption. Ensuring that the air purifier you get has enough activated carbon to handle tobacco smoke inside your home is extremely important. Even more so if you light up cigars. There are many cheap products on the market that claim they can help with smoke, but the results are very poor and a huge waste of money. As you just learned, the process of creating activated carbon is no simple task and this feature comes at a price. A smoker can’t afford to cheap out on this type of filter in an air purifier. A large amount of carbonous material is required to adequately remove tobacco odors. The two air purifiers listed above are the best in their league when it comes to getting rid of smoke. You won’t find any other device that’s capable of eliminating odors like these. Investing in either air purifier will work very well for your needs. The biggest question you have to ask yourself is “How much room coverage do I really need?” That answer should narrow down which one you actually buy. The Rabbit Air MinusA2 is good for areas up to 700 square feet and the Austin Air HealthMate HM 400 can handle 1,500 square feet. 5 Ways for How to Get Rid of Cigar Smell Fast! What is Thirdhand Smoke and Why is it a Concern?